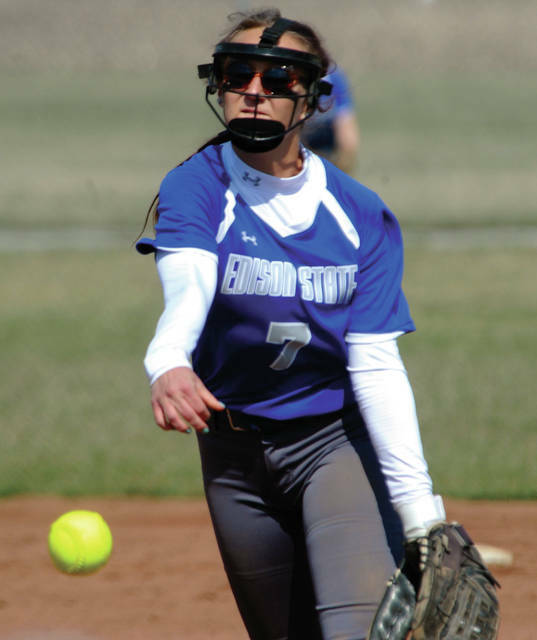 Edison State second baseman Rayna Brownlee throws a runner out at first against Cuyahoga Community College Friday. 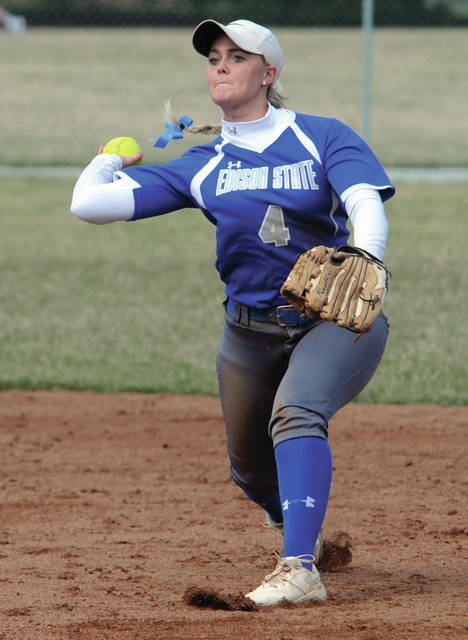 Edison State pitcher Alexis Romine fires a strike against Cuyahoga Community College Friday. 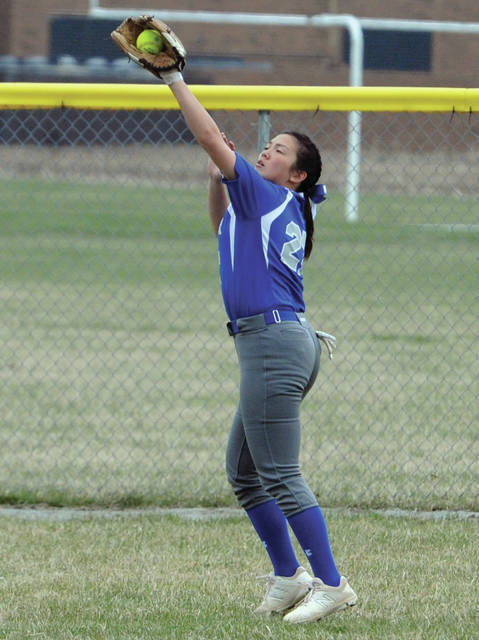 Edison State’s Camille Odle makes a catch in rightfield Friday. Edison State’s Wendy Hawk gets a force out of Cuyahoga’s Breanna Musick Friday. Edison State first baseman Katie Tackett throws a runner out at first base. 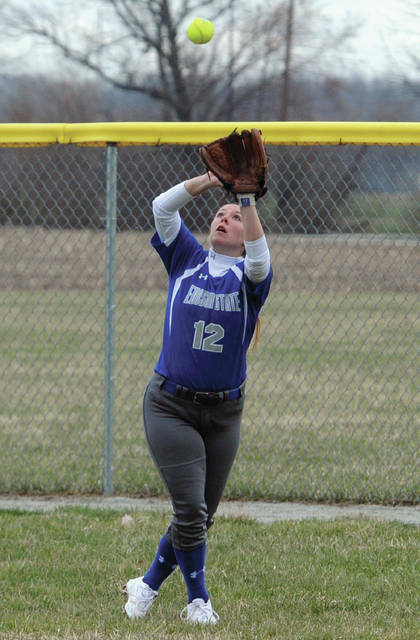 Edison State centerfield Maddie White makes a catch in centerfield Friday. PIQUA —- What a difference a game —- or maybe just an inning —- makes. 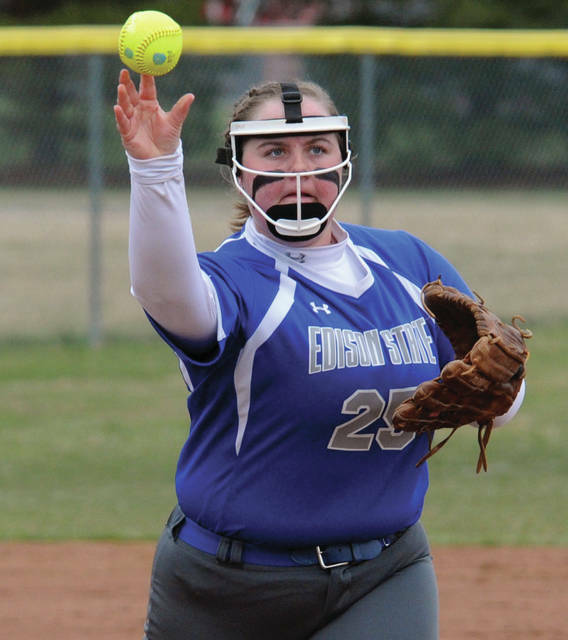 After the Edison State softball team had a perfect game thrown against them in the opening game of a doubleheader with two-time defending OCCAC champions Cuyahoga Friday, it took the Chargers just one inning to bounce back. In the first inning of the second game, Edison batted around to score eight runs and held on for a 9-7 victory to split the doubleheader. The Chargers are now 7-9 overall, while Tri-C is 16-6. After Cuyahoga had scored two runs in the top of the first of the second game, Mackenzie Smith opened the home first with a double and Adrianna Hicks followed with a single, before Wendy Hawk drew a one-out walk to load the bases. 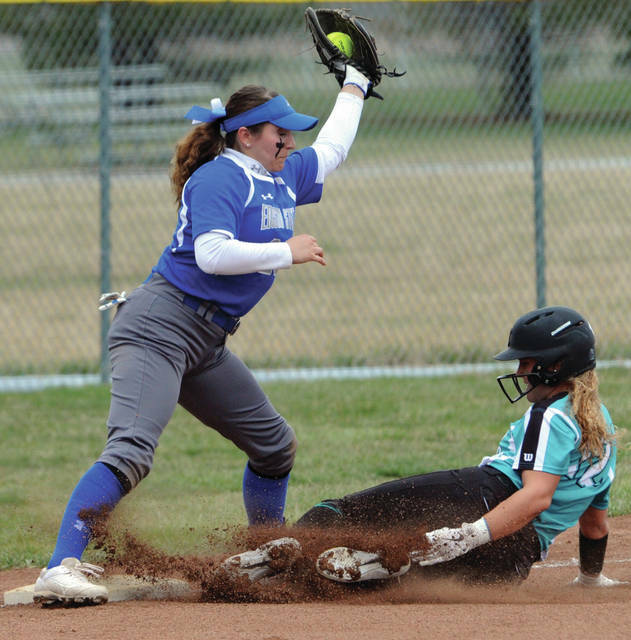 Maddie White had an infield single to score a run, Rayna Brownlee had a RBI single, Hallie Snyder had a two-run double and Hannah Oaks had a RBI single to make it 5-2 and Tri-C starter Brooke Crider was replaced by Mackenzie Mosier. Smith, who would go 4-for-4 in the game and Hick both had RBI singles to make it 7-2. “Mackenzie Smith came out and set the tone for us with that double and everybody hit,” Cain said. That brought in Baglia. Her perfect game mastery didn’t carry over as Alexis Romine greeted her with a RBI single to make it 8-2 before Baglia ended the rally. “Lexi struggled a little at the plate today, but she greeted Baglia with that shot up the middle,” Cain said. Daniele Rivera entered in the third inning for Cuyahoga and held the Chargers to three hits and one run the rest of the way —- a RBI single by Mackenzie Smith in the third. “We lost our patience and decided to just go up there swinging,” Cain said. And Tri-C wasn’t going to go down without a fight. The Challengers got one run in the fourth and four more in the fifth to get within 9-7. Edison also made some big plays defensively. Brownlee at second base turned two double plays and the Chargers got an out in the four run inning when Romine took a throw from the outfield and caught a runner between third and home for an out. One came in the sixth inning after Lexi Rhem had a leadoff single and Romine survived the seventh, when Tri-C put the tying runs on. She helped herself during the inning, getting a forceout at third on a bang-bang play. In the opening game, Cuyahoga dominated. The Challengers had 17 hits while Edison never had a baserunner. Alexis Lopez hit a three-run homer and Baglia dominated on the mound. She faced the minimum 15 batters, striking out five. The Chargers will be back in action Saturday, hosting Lakeland for a doubleheader. After a big-bounce back to get a win over a nationally ranked team.